Delhi Government announced its budget for the financial year 2016 on 28th March 2016. India follows a federal system of government. For functioning of the states, they are provided with certain central allocations by the central government. The state further collects revenue for expenditure on development allocations deemed right by the State Government. In this piece, I aim to bring more meaning to these numbers by closely looking at the socio-economic-environmental conditions of Delhi while keeping the background of the newly signed and committed Sustainable Development Goals by India. With 0.05 % of India’s land, 1.4 % of India’s Population, 4% contribution to the National GDP, Delhi’s budget is a miniscule amount of INR 46600 crores (1/41th part of the Union Budget 2016).The second most populous urban agglomeration has the second highest number of billionaires and millionaires among all cities in India (Registrar General & Census Commissioner, 2011). Further, as of 2013, the per capita income of Delhi was INR 2.1 lakh, the second highest in India (Government of Delhi, 2015). With all the glory of wealth and income booming in Delhi, it also has more than half its population living in slums highlighting the high income and social inequalities existing in this state (Mahpatra, 2012). Environmental indicators of Delhi are also not very pleasant. Yamuna, one of the biggest rivers of India that passes through Delhi, is one of the most polluted in the world near Delhi area. The city dumps 58% of its waste into the river. High levels of ammonia recently disrupted the water supply in various parts of Delhi (Press Trust of India, 2016). The quality of air is a usual topic that catches Delhi’s and the world’s attention, following the odd-even rule and other pollution control schemes by the current Delhi Government. Having awarded the most polluted city in the world (Chauhan, 2014), according to one estimate, air pollution causes the death of about 10,500 people in Delhi every year (Time Magazine, 2014). This piece looks at a panoramic view to map what development trajectory Delhi budget 2016 has taken and what does it mean for the people of Delhi. It assesses the priorities and focus of the government by studying the budget allocations in various sectors. These are studied against the framework of Sustainable Development Goals. Big Push to social development, but is it sustainable? While 11% of the total budget is on health with huge allocations on setting mohalla clinics and poly-clinics, is applauded for its intent to provision of health care services to all, there is need to increase focus on preventive aspect of health care, focusing on maternal mortality, prevention of spread of communicable disease. B. Delhi is hoping for a continuous non-terminating water supply, but where on earth will it get that? Access to water has gained special attention under this government but sustainability and security of water supply, which faced recent tensions during the Jatt agitations, indicate the criticality of the issue. Not much ambition has been raised to maintain and sustain available water resources like Yamuna. With free basic access to clean water, and the portability of water in Delhi from as far as 325 Kms from Tehri in state of Uttarakhand, the sustainability of water availability and access is a big concern. This mole can become a mountain if not timely taken care of. 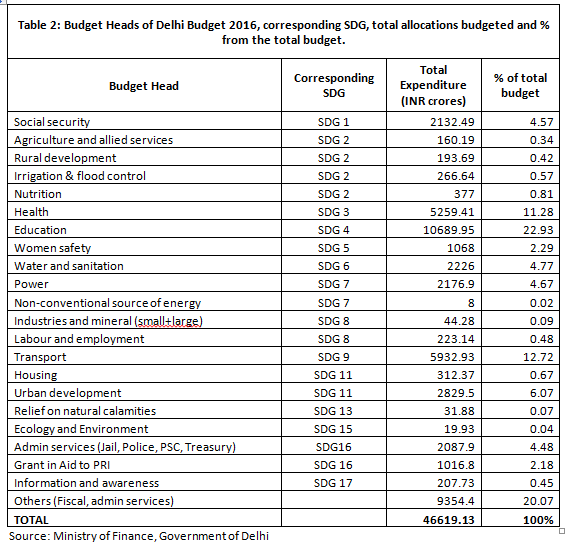 The Delhi Government budget speech highlights the success of the last years’ budget by stating certain facts. These were about the substantial increase in the GSDP (13%), per capita income (11%) and contribution of Delhi in the National GDP (2.5%) from the previous year. While these are commendable achievements, it is not appropriate in a city with gross inequalities. An indicator, perhaps Ginni coefficient, or growth in incomes and livelihoods of the bottom of pyramid could have been a better economic indicator. Another important indicator missed is that of jobs and livelihood opportunities. Delhi fares worse than rest of India in terms of unemployment. Unemployment rate in urban area of Delhi is 40 per cent as compared to a national average of 34 per cent (Hindu, 2014). Social entrepreneurship and promoting green jobs are some opportunities that Delhi government must explore. Slashed VAT rates on various daily use items like footwear (>INR500), readymade clothes (>INR 5000), school-bags (>INR 300) have also highlights in most of the newspapers. What have not caught the highlight is who is going to benefit from such VAT rates and whether the government has prioritized things right. These tax cuts will one, incentivize the middle class of Delhi, who are consuming most of these products to increase their expenditure on such items. At the same time, it also promotes production and market of such products and perhaps increases economic activity in the area. What looks to be a great step for the middle class and the economy actually is hurting our environment. Delhi is a representative of an Indian model of ‘west’ where consumerist behavior is leading to higher production, higher resource use and exploitation of the limited natural resource base and exploiting resources beyond earth’s bio-capacity. A visionary government like that in Delhi, must be cautious about what kind of production systems and consumerist choices does it want to promote. Perhaps a tax incentive on greener technologies, production could have promoted sustainable development. Air pollution is the sole focus of Delhi Government, largely focusing on pollution on roads due to sweeping and increasing vehicles on the roads. Not to undermine this intervention, but Delhi has a lot more to be concerned of than just pollution on roads. Natural resources like land, forests, water systems and air are lifelines for any city. Delhi Government must proactively act upon, efficient and sustainable land use, expanding its green cover, and managing water resources sustainably. It must ensure greener production processes, behaviors in order to lead to healthier relationship between person and environment. The health of the people, the sustainability of a city, and quality of life is all intrinsically linked with the health of natural wealth of a city. How a city best uses its available resources for a healthier people and planet is a challenge that every government must put on itself. *20% of the Budget is under Fiscal, administrative services, interest payments and does not directly contribute to any of the 17 SDGs. In case of Delhi Government (see figure), primary focus has been on the destination (48%) and commendable steps have been taken to achieve the same but what has been forgotten is that the fuel to be at the destination will be exhausted (0.1%) and unless Delhi envisions to sustain its fuel- land, water and other natural resources, it will not be able to forever cater to its genuine ambition of well-being for its citizen. Chauhan, C. (2014, May). Delhi is most polluted city in world, Beijing much better: WHO study. Hindustan Times . Government of Delhi. (2015). “Stattistical Abstract of Delhi 2014. Delhi. Hindu. (2014, October 11). Delhi fares worse than national average in terms of unemployment. The Hindu . Mahpatra, D. (2012, October 4). Half the Delhi Population lives in slums. Times of India . Press trust of India. (2013, June 6). Demand for Power in Delhi. NDTV . Press Trust of India. (2016, January 20). Water woes for Delhites due to high ammonia levels in Yamuna. Business Standard . Raizada, D. M. (2015, February 24). Healthcare challenges to new government in Delhi. The Indian Express . Ramchandra, R. (2015, October 5). 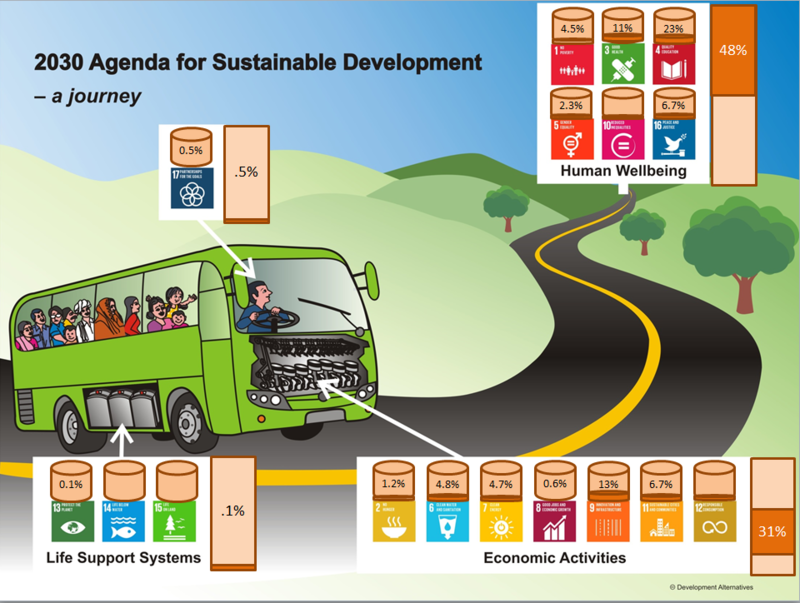 Demystifying the Sustainable Development Goals. Huffpost . Raparthi, B. (2013). Challenges in Delhi Power Sector Regarding Domestic Consumets and viable solutions through demand side management and renewable energy. National Power Training Institute. Registrar General & Census Commissioner. (2011). “Urban agglomerations/cities having population 1 million and above”. Census of India. Time Magazine. (2014, February 10). Delhi’s Air Has Become a Lethal Hazard and Nobody Seems to Know What to Do About It. Time . Sustainable Development Goals are 17 Goals committed by 180 member states of UN, including India to be achieved by 2030. These include social, economic and environmental targets for people’s and planetary well-being. For more information, please check here.